Get Married Here Any Time of the Year! Basswood Chalet is a beautiful chalet-style home with a 22 foot river rock fireplace in the living room. The home is decorated with an Old World European elegance ambiance, including leather sofas, richly appointed upholstered furniture, fur pillows and throws and warm woods throughout. Our facility is fully air conditioned and heated, so ceremonies are held year 'round here. Located on 9.9 acres of trees and marshland across from Lower Long Lake, there's bound to be a perfect place for you to say I do! 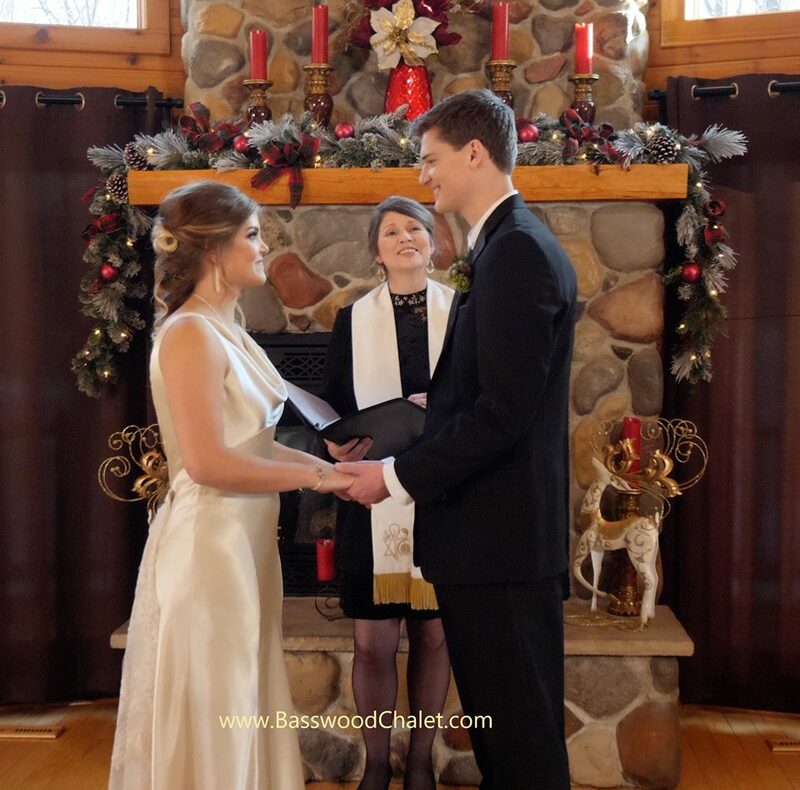 There are several locations in and around Basswood Chalet that lend themselves well to ceremonies. Consider getting married, renewing your vows, hosting a commitment ceremony, eloping or baptism here! 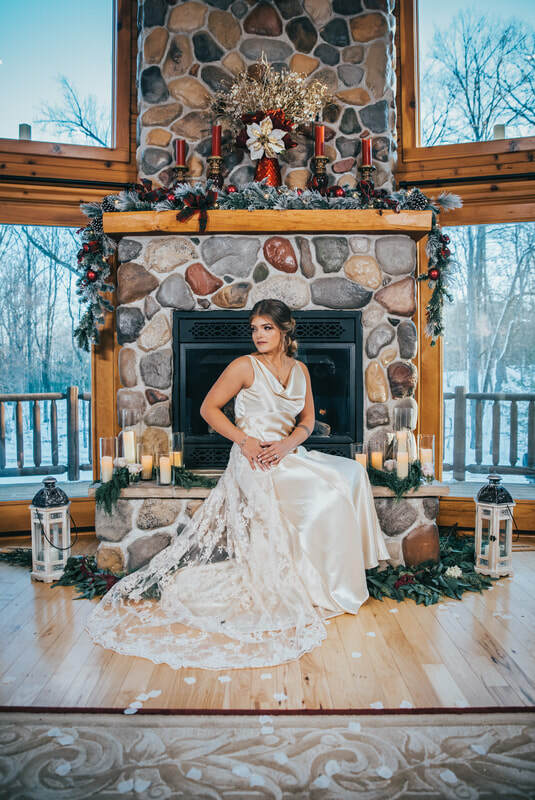 ​Packages start at $950 and all include the services of a seminary-trained, formally ordained minister and a seasoned photographer/videographer. Options abound, as our goal is to help you fulfill the day of your dreams. The Chalet's main focal point inside is a romantic 25-foot river rock fireplace located on the main floor. 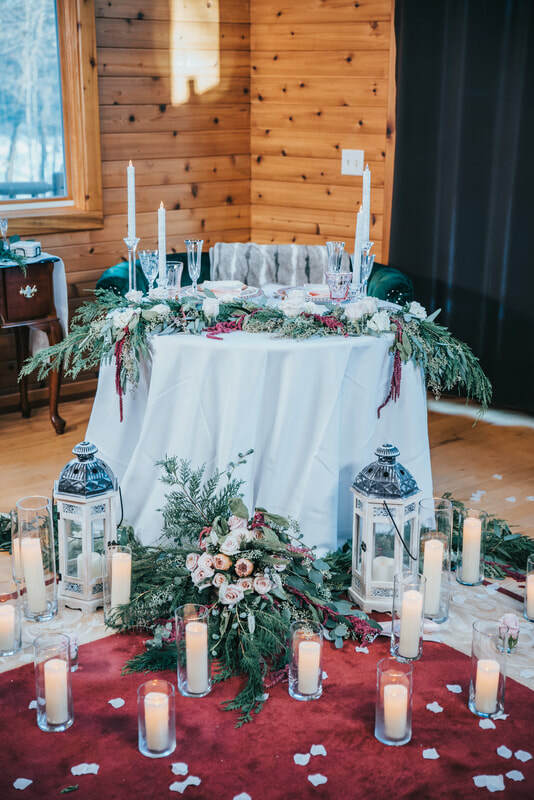 Exchange vows with a warm glow behind you as your guests relax on leather sofas and Old World style furniture, surrounded by fur pillows, super-soft throws and elegant touches. Have a few more guests? We move the center furniture out and set up more traditional aisle seating for you. ​Each season brings beautiful views through the windows, but the Chalet becomes truly magical in the winter! Intended for small, more intimate ceremonies and guest lists. Perfect for your micro wedding! 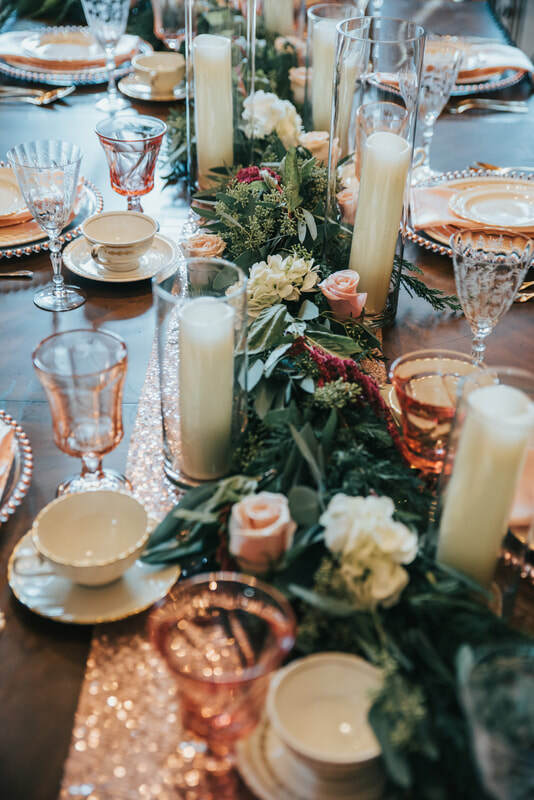 Serve coffee, tea, finger sandwiches or petit fours to guests or a 14-course, sit-down dinner here to make memories that will last a lifetime. 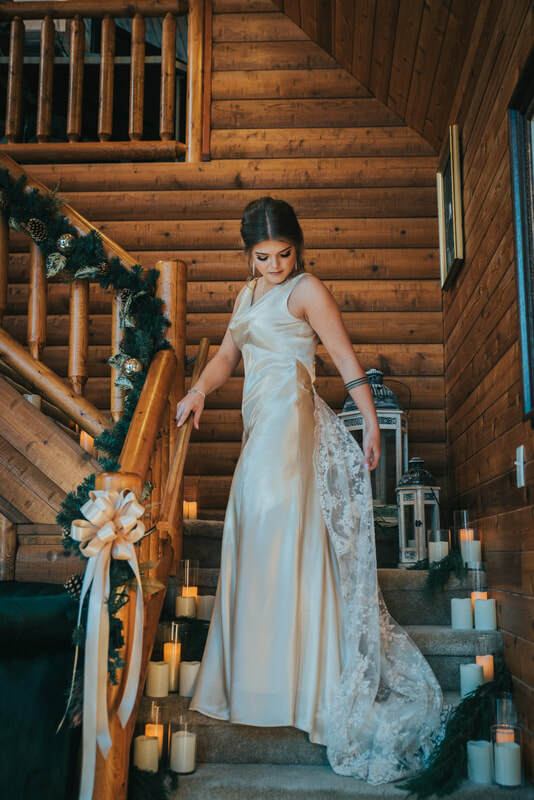 Brides get ready in the loft above the fireside room and prepare for their grand entrance. Warm woods and elegant touches make for dramatic photos. Simple or elegant reigns here! This is your day and we're here to help you make it happen. Choose sit-down or buffet style service by your licensed caterer. Your fireside sweetheart table awaits you! 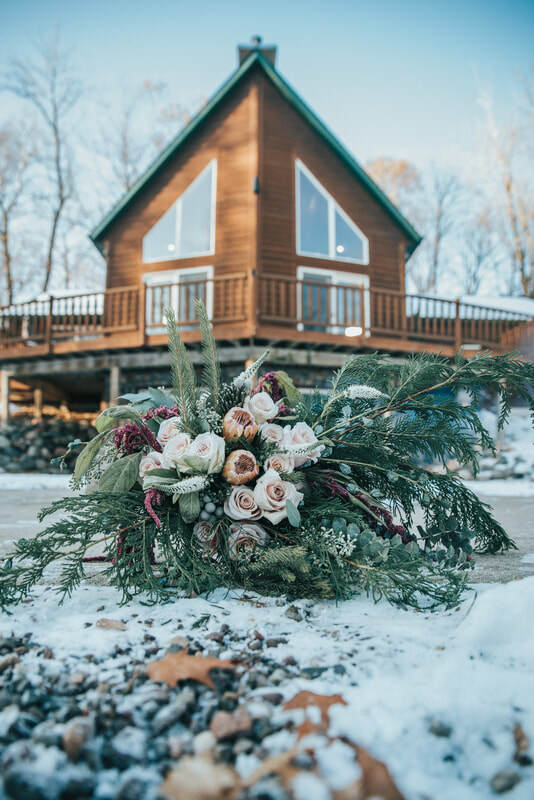 Romeo and Juliet will be with you in spirit when you choose to exchange your vows outdoors on the wraparound deck of the Chalet, your guests watching from the courtyard below! In the summer, hummingbirds visit the deck's feeders almost continuously. Hummingbirds are known as birds of love in certain cultures, and there is no shortage of either here at Basswood Chalet! Set up tents in the courtyard and your caterer can serve from one of the garages. Dine while surrounded by woods and marshlands with the lake's loons calling in the background. Decades before Basswood Chalet & Guesthouse was built, the land was a deer farm. Many of the descendants of those original deer still wander the woods, keeping beautiful trails open such as the one pictured here. Imagine being married under a canopy of trees, the sun streaming down onto the two of you as you do what seems so natural - binding your hearts and souls together for all eternity! The trail leading to this site is manageable for those who may be walking-challenged, or a regular-sized vehicle or horse-drawn carriage can be driven right up to the site. 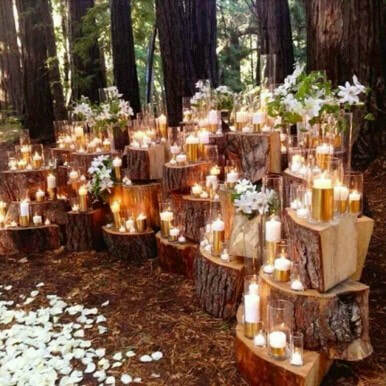 Decorate with lights, draped fabric and a chandelier in the trees to create a fairy-like Bohemian setting. Summer sunsets are often accompanied by fireflies among the trees, calling to their mates to come home before darkness falls. Can you imagine anything more beautiful, natural and magical than this? complete the form below and we'll be in touch very soon. one ceremony per day to assure all attention and eyes are on you!